Paw Province: Chicks Are Here! Here's my mom's 4 day old chick, Jagger, at 2 days old! Yep, that's right, the 7 chicks all came safe and soundly and are doing well. 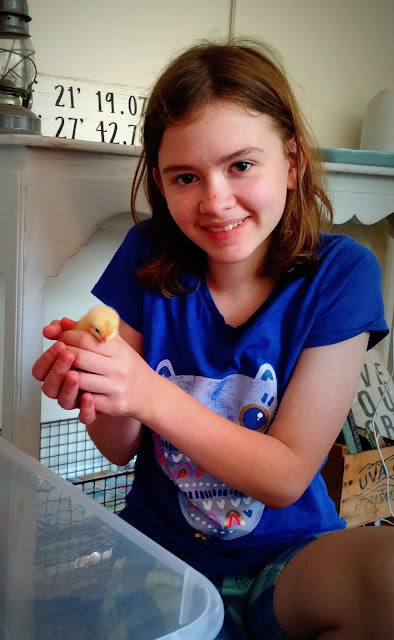 The peeps are letting them settle because they're so new, and in a house full of critters it isn't safe to take out the chicks for long, but the humans are still very excited. Every family member gets to name one chick, and so far we have Jagger (pictured), Leia, Violet, Emily, and three whose named haven't been decided yet. Apparently I'm not as much of a chick magnet than I thought I was, which is hugely disappointing. Jagger is just too cute! Nice to meet you Jagger! Wow! What a cute little peeper! Can't wait to see the others! What a little yellow cutie!!! Welcome, Jagger!! Oh how sweet he looks. Have fun raising your baby chick. Welcome to a great home, Jagger - we can't wait to watch you grow. OMD, HEY JAGGER!!!! What a cutie patoooootie!!! Don't worry Chris....I am sure all the doggie chicks down at PetSmart thinks you are daBOMB! hi Jagger... you are super cute!